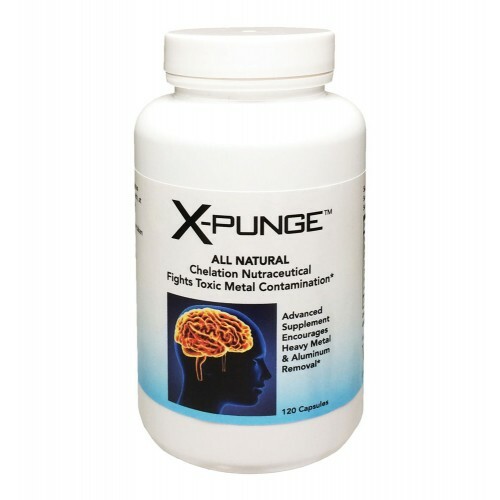 All-natural X-Punge™ helps neutralize many toxic elements that can build up in the brain and can result in serious consequences, including cognitive impairment and metabolic disorders. By helping to remove toxic elements, X-Punge helps bring the brain and the body back into balance, resulting in improved memory, better mental clarity and increased energy. X-Punge is designed to cross the blood/brain barrier, enabling proper cerebral metabolism and blood flow, which allows for appropriate elimination of toxic elements.When taken with alcoholic beverages, the blood-brain barrier is overcome even further, thus producing truly superior results. X-Punge is readily absorbed by the body, due to the catalytic effect of its quality ingredients. X-Punge works synergistically with Plaque-Out, a companion product that is used to help clear the brain of harmful plaque deposits, and it is GMO, soy and gluten free. For best results a comprehensive multi-mineral formula should be taken two hours or more after taking X-Punge. Cognitive enhancers may be taken with X-Punge, if desired.